This is probably the most delicious thing one can do with a canned refrigerator biscuit. Punch a hole in it, fry it, and roll it in cinnamon sugar. These are best eaten warm, but will still make you smile a couple of hours later, if there are any left. Be sure to have everything ready before you heat up the oil because these babies fry up pretty fast. If you find they're browning too quickly, either remove the pan from the heat for a few minutes, or add some more oil to cool it down and then turn the heat down as well. Veteran fryers should have no problem; beginning fryers, you might want to make sure you have at least two cans of biscuits in case the first can turn a dark, inedible mahogany color. Put 2-3 paper towels on plate. Put cinnamon and sugar in large paper bag or mix in a pie plate. Heat oil to a good frying temp...375 degrees? I never check the temp with a thermometer. Just get it pretty hot over medium heat. While oil heats, open biscuits. Take each one and with your fingers, stretch a large hole in the center. When oil is hot, fry about 3 at a time, turning after the bottom is a deep golden brown. Fry on second side until the whole thing is a deep golden brown. 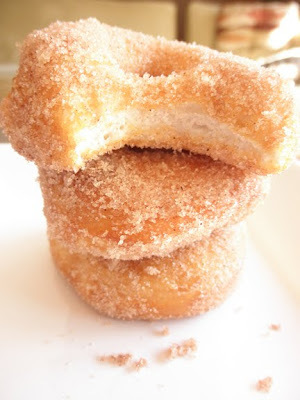 Remove each donut with tongs and toss in cinnamon sugar. Use another pair of tongs or a fork to move them to the paper-towel lined plate. Continue frying until they're all fried. Remember to turn the heat off when you're done. I use a screw top from a sode/water bottle to cut a hole in the middle then I fry those too and have donut holes. You can use any vegetable oil that you like to fry with.